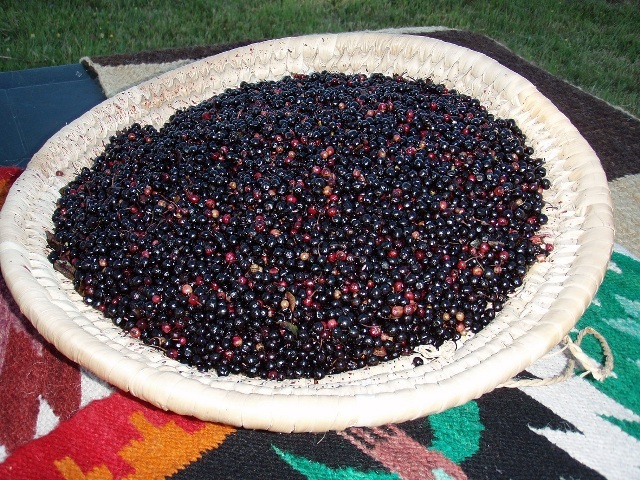 Macqui is also known as Chilean wineberry. It is believed to be a native of Chile. 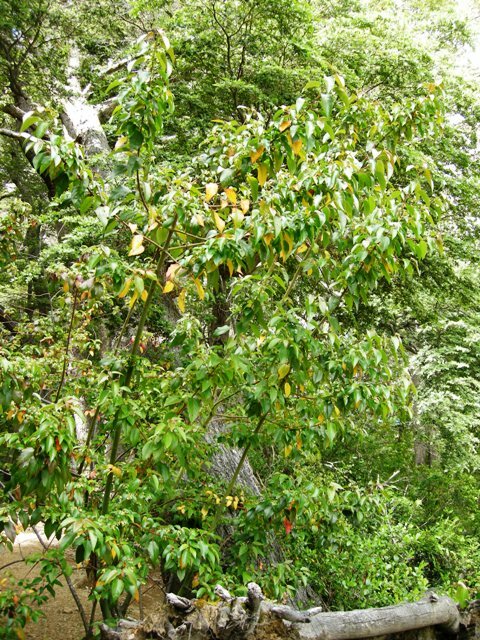 Besides Chile, it also grows wild widely in parts of Argentina. It has now been introduced in a few other countries too. 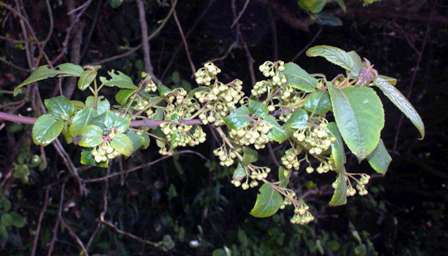 A medium to large evergreen shrub, 3-4 m high, glabrous, except young branches; stems reddish brown. Leaves perennial, opposite or sub-opposite, ovate-lanceolate, serrate, pecioles 0.5-3 cm in length, twisted; laminas 3-7cm long (rarely up to 12 cm), glabrous; stipules 1-1.5 mm. Flowers borne in short panicles, 1-2 cm long, with variable flower number; flowers yellow, 3-5mm long, peduncles are pubescent; calyx composed of 5 (6) deeply lobed sepals, lanceolate, obtuse, pubescent, 2-3 mm length; corolla composed of 5 (6) free petals, alternate with the sepals, entire, 2.2-4 mm length; Stamens are 10-18 in two series, poral dehiscence; Filaments more or less a fifth of the anther; Anther is linear, 1.8-2 mm long, inconspicuous and sterile in female flowers; ovary 2-3 lobes, glabrous; styles 2-3, fused at base. Fruit a spherical berry, smooth, 2-3 locular, joined to the receptacle, dark violet- rarely white, 5-6 mm in diameter. Seeds 2 per locule, 1 convex face and 2 flat faces, brown, 2.5 mm long. The fruits though small, have a pleasant taste. These are eaten fresh and also dried for use later during winter months. A wine is made from the fruit. This wine is said to have medicinal properties. Macqui fruits contain a high concentrations of anthocyanin pigments giving which give the purple colour. This deeply coloured pulp is used as a food colouring. Because of this, the fruits are commercially used for extraction of colour. 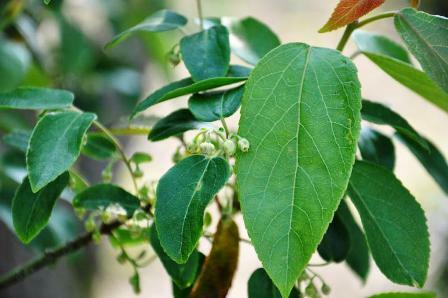 The leaves are used in throat complaints, to wash mouth ulcers and as a febrifuge. It has been shown to have a relaxing action on muscular fibres. It is used against intestinal tumours, tonsil inflammation, burns, diarrhoea, and as an analgesic (Hoffmann. The fruit is rich in antonians. It is astringent and refreshing; as an infusion is administered for fever, diarrhoea and dysentery. Macqui is not grown on orchard scale. It is planted only in home gardens. Most of the he fruits coming to the market, are from the wild. 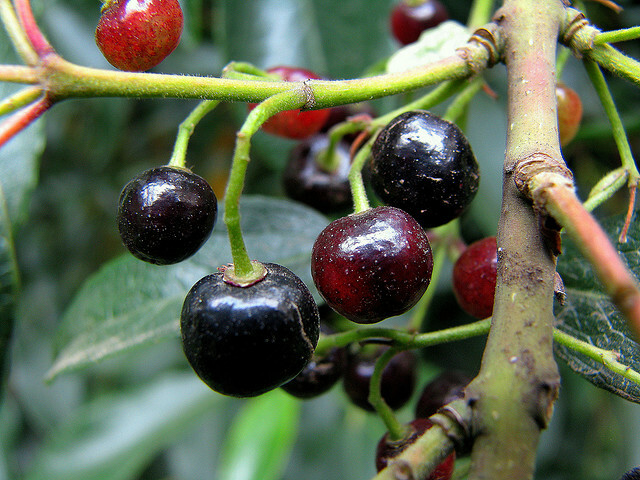 The volume of wild harvested fruits in Chile for the production of colourings is estimated to be more than 90000 kg per year. This indicates the economic potential macqui. Macqui prefers moist places with rich organic earths. It is a colonizing species in disturbed areas and on some occasions generates monospecific associations. It is tolerant to different soil types and can grow in direct sun or semishade, requiring medium watering. It can withstand temperature upto -10 C.
It is easily propagated from macerated seeds planted in a substrate composed of an even mix comprising of equal parts of compost, garden soil and sand. Vegetative propagation is possible by using semi hardwood or softwood apical cuttings. One plant can produce up to 10 kg of fruits on an average after seven years. Much, however, depending on the quality of the growing conditions. The fruits are processed to produce a pulp. The fruits are dipped in boiling water to loosen the skin, before being ground, extracted and pressed. It is exported in this form as a raw material for the production of natural colourings.